tivùsat is the first Italian free to air satellite platform. tivùsat was created to ensure that everyone has access to the free digital TV. By reaching all areas of the Italian territory, viewers can access all national DTT channels and a huge line up of national and international channels. Accessing tivùsat is simple, all you need is a satellite dish pointed at Eutelsat Hotbird 13°, a tivùsat certified device and a smartcard which can be activated in a few minutes. tivùsat, offering digital TV and radio services, gives free access to traditional Italian mainstream television channels (Rai Uno HD, Rai Due HD, Rai Tre HD, Canale 5, Italia 1, Rete 4, La 7) without any dimming of the programming schedules, to digital television channels (both national and local) and to a large selection of most popular international channels. 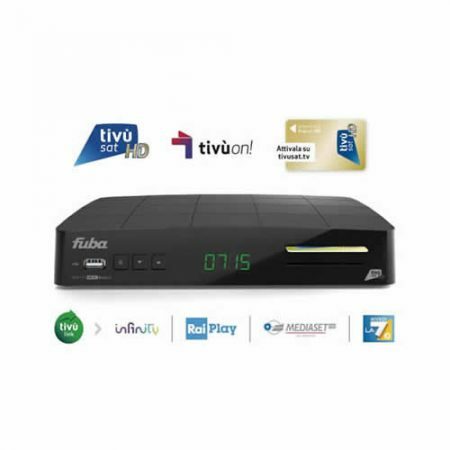 Fuba ODE 715 tivù HD is the satellite receiver that will delight you with its high definition quality. It gives free access to all the channels broadcasted by TivùSat, the platform which offers all the free terrestrial Italian channels to the satellite, from DVB-T to DVB-S. In addition to this, with Fuba ODE 715 tivù HD you can enjoy with all the other FTA satellite channels. It is the most advanced decoder for its category and guarantees viewing of live TV and interactive services* (subject to geo-blocking). Recording functions as well as time shift are available when used with a USB hard drive, and comes with remote control which can be programmed to manage any modern television. The user interface has also been redesigned for a smooth transaction between menus. Please note, TIVUSAT CARDS NEED A VALID ITALIAN ADDRESS and CODICE FISCALE in order to be activated. Make sure you have those prior ordering as without them YOUR CARD CANNOT BE ACTIVATED. 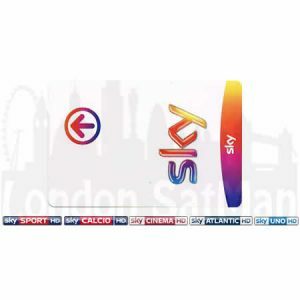 London SatMan can help you with activation if those details are provided at the time of purchase. Available for online purchase or with domestic professional installation for London area. Please select the option that best suits you. Price for the domestic installation is intended for the fitting/installation of the satellite receiver on an existing satellite system with dish pointing at Hotbird 13E and does not include cost of parking and/or Congestion Charge if the property is located in the restricted area and/or with no-free parking.